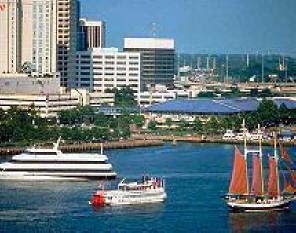 Norfolk, Virginia is the home of the world’s largest Navy base, has miles of sandy Chesapeake Bay beaches, a historic downtown district, a complex of waterfront shops and restaurants, a collection of cruise boats and ferries, and an excellent selection of museums. The city is centered around the port of Hampton Roads, one of the largest, naturally deep, ice-free harbors in the world. You can see tugs, barges, sailboats, commercial vessels, and navy ships moving in and out of the port through the Elizabeth River. Norfolk’s downtown waterfront area is located right on the banks of the Elizabeth River. The Norfolk Waterside Marketplace, the centerpiece of the waterfront district, offers dining, shopping. Special events, such as the annual Norfolk Harborfest, are held next to Waterside, at the waterfront Town Point Park. Nauticus, the National Maritime Center, is a must see. The Nauticus museum complex is located on the Norfolk downtown waterfront, adjacent to Waterside and Town Point Park. 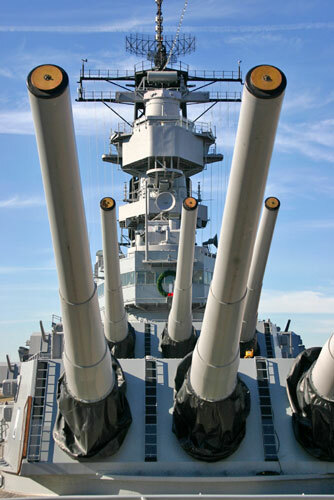 Nauticus includes the Hampton Roads Naval Museum, National Oceanic Atmospheric Administration exhibits, and the historic Battleship Wisconsin docked alongside. Exhibits at Nauticus include touch tanks, shark petting lagoon, weather deck, and an Aegis-class destroyer battle simulation. You can take a self guided tour of the Wisconsin’s main deck Tuesday through Saturday 10:00 a.m. to 5:00 p.m. and Sunday 10:00 a.m. to 6:00 p.m. The Victory Rover offers daily two-hour cruises of the Norfolk Navy Base from the Nauticus pier. Norfolk’s cruise ship terminal is located adjacent to Nauticus and the Wisconsin. Carnival Cruise Lines sails regularly from Norfolk to the Bahamas, so you might get to see one of the big ships at dock. Check out the NorfolkVisitor website for details about the cruise schedule. A few block away from the waterfront area, you’ll find the MacArthur Memorial. The stately domed structure pays tribute to General Douglas MacArthur and the millions of men and women who served with him in World War I, World War II, and the Korean War. There’s a welcome center, a museum, an archives and research center, theater, and gift shop. Admission is free. Visit the MacArthur Memorial Website for a downloadable podcast guided tour of the museum. Adjacent to the MacArthur Memorial is the MacArthur Center Mall, which offers upscale shopping, restaurants, and entertainment. If you’d like to explore some more downtown shopping, the historic Ghent district has many interesting boutiques, cafes, and galleries. From Memorial Day to Labor Day, Norfolk Trolley Tours provides transportation to these areas plus the Chrysler Museum of Art and the Norfolk Naval Base. The Trolley Tours are operated by Hampton Roads Transit and tickets are available at any of their information kiosks, including the one in Waterside. Norfolk visitors will notice the mermaid statues scattered throughout the town. The fanciful mermaids were designed by local artists and auctioned off to raise funds for Hampton Roads arts organizations. The mermaids are now located at businesses and public spaces throughout the area. Downtown Norfolk mermaids list. Norfolk Scope and Chrysler Hall are the home of Norfolk’s major sporting and concert events. Scope’s domed roof and distinctive support structure is a well-known downtown Norfolk landmark. Scope is the home of the Norfolk Admirals Hockey team. Scope is also the venue for many concerts and events throughout the year. Scope schedule of events. Chrysler Hall, located adjacent to Scope, is Norfolk’s fine arts venue. Chrysler Hall is the home of the Virginia Symphony, and hosts traveling Broadway shows and other concert events. 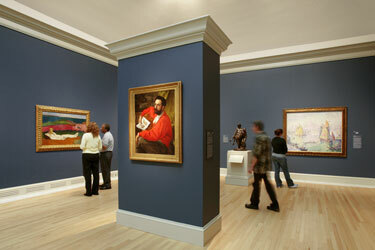 The Chrysler Museum of Art is a great place to see a very fine and varied collection of art. The museum was established around a donation of nearly 10,000 objects from Walter Chrysler, Jr’s private collection. The museum’s collections include Contemporary Art, Modern Art, Decorative Arts, Photography, American Paintings and Sculpture, European Painting and Sculpture, an Ancient Worlds collection, and Glass collection that is one of the largest and most comprehensive in the world. The museum’s collections include pieces by some of the world’s great artists, including Winslow Homer, Mary Cassatt, Edgar Degas, Pierre-Auguste Renoir, Paul Cezanne, Edward Hopper, Ansel Adams, Georgia O’Keefe. (Note: the museum has been closed for renovations and will re-open on May 10, 2014). The AAA Norfolk Tides baseball team plays in downtown Norfolk at Harbor Park. You can see ships coming and going beyond the outfield wall at this excellent ballpark. The Norfolk Tides are the AAA affiliate of the New York Mets. Home games are held at Scope, in downtown Norfolk. Games usually begin at 7:15 p.m. on weeknights and 7:30 p.m. on weekends. You can explore downtown Norfolk and the Elizabeth River via a number of cruise offerings. The tall ship American Rover sails daily April through October from Waterside. The Spirit of Norfolk, is the largest ship cruising the harbor and has two climate controlled decks, open strolling decks and lounge seating, dance floors, and buffet dining. The Spirit of Norfolk offers daily lunch and dinner cruises. The Victory Rover sails daily from the Nauticus Pier on tours of the Navy Shipyard. The tall ship American Rover offers two-hour narrated sails of the harbor daily. You can also board the Elizabeth River Ferry to visit Olde Towne Portsmouth, which is located right across the river from Norfolk. More information about Norfolk harbor cruises. Sites worth seeing beyond the downtown district include the Norfolk Botanical Gardens, the Virginia Zoo, and the beaches of the Ocean View area.